Are you looking for someone to hook up with? Is that the reason why you’re at this SnabbFlirt review? Lucky for you because I have here a review about SnabbFlirt which will help you get to know the site before you hit that sign up button. In today’s innovative technology, everything is possible online. You can research about something online or order your favorite meal online without having to set foot outside. Of course, this also includes finding a date online and not in the traditional way anymore. With the use of the internet, computer or Smartphone, people can easily find a potential match that they can flirt with. The rise of online dating sites is one of the many reasons why people prefer to see a match on the internet. One of the sites today, where people can flirt freely, is SnabbFlirt. Before you get too excited, it would be best to read the review below to know if this is the site for you. SnabbFlirt was established in the year 2015 and is known as an adult dating site. The site caters to everyone, including straight, lesbian, gay, and bisexual orientation. SnabbFlirt ’s goal is to make online dating for everyone fun and exciting. You can find like-minded people here which means that finding a potential date is definitely possible. Whether you are someone who is looking for a fling or a casual encounter, you will surely find it here on SnabbFlirt. 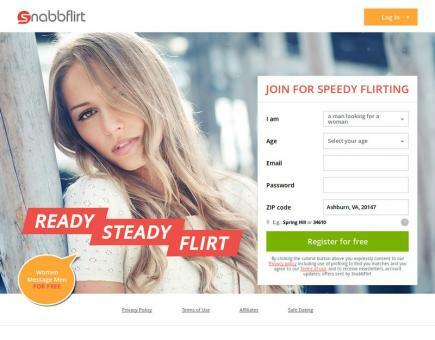 Signing up on SnabbFlirt is pretty straightforward because you don’t need to fill up a lot of information just to get into the site. The site will only require your gender and the gender that you’re looking for. Your age will also be asked, email address, and your password. After hitting the sign up button, you can verify your account using the link that was sent to your email address. The verification link will ensure that your profile won’t be flagged as fake or a scam. For you to be able to get a match immediately, you need to complete your profile as soon as your account gets verified. The reason behind this is because completing your profile will help other members find it once they start searching using specific filters. When completing your profile, it would be best to fill in all the information needed. You should also write a short description of yourself and the person that you’re looking for. Lastly, uploading a recent photo is another essential thing. So make sure upload a decent picture and a clear one. When it comes to the members on SnabbFlirt, they are pretty diverse because of the range of members that they have. As mentioned above, there are straight, gays, lesbians, and bisexuals here. Their age also ranges from 18 to 50 as the site always makes sure that there is no underage on the site which can cause a big problem on their part and their members. Also, the majority of their members are willing to meet up and have a casual encounter without worrying about any strings attached. So if you are someone who is looking for a no commitment sexual relationship, then SnabbFlirt is the one for you. Searching for members on SnabbFlirt is pretty easy since they made sure to include filters. The filters will help you find members that you preferred. You can search based on your preferences using the filters, including age, body type, location and more. Once done, the site will give you a search result with all the members that have the preferences that you choose. Using the filters will surely help you find that match that you want to be with. Some of the features that are included in the paid membership are instant messaging, full-size photos, advanced communication, advanced search tools, chat rooms, and video chat with webcams. When it comes to the privacy and safety of SnabbFlirt, you shouldn’t worry because the online dating site will never ask for more personal information about you. Your location and your postcode are the ones that will be asked. Another good thing about SnabbFlirt is that they allow members to block other members who they no longer feel to talk with members who have offended them. Lastly, SnabbFlirt has a tip that you can follow to ensure that you can enjoy and be safe on the site. With all these being said about SnabbFlirt, I can safely say that signing up on this site won’t be an issue. Start signing up now and you will surely be meeting that like-minded match to flirt with.